This article was written on 26 Jun 2017, and is filled under Art Department Resources, Past Exhibitions. Starting on June 22 and continuing through August 11, the gallery will have a varied selection of works from the Permanent Collection. This exhibit was curated with the assistance of two current students, Nikki Maggiori and Emily Lanigan. They had an opportunity to research paintings, drawings, prints, sculpture and ceramic works and install them in the gallery. 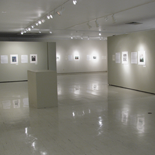 The exhibit features an number of recent acquisitions, but also pieces that are not regularly displayed in the gallery. New works include donations from the Madison Print Club and Dr. Mary Rubinstein and several examples from our collection of Leon Pescheret prints that are currently undergoing conservation in anticipation of a major exhibit of his work in the spring of 2018. Gallery hours in the summer are from 10 am – 4 pm Monday through Friday.